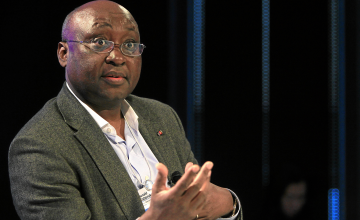 In November 2013, Donald Kaberuka, President of the African Development Bank Group, was named the recipient of the 2013 Daily Trust African of the Year award. A statement by the chairman of the award committee and former President of Tanzania, Salim Ahmed Salim, revealed that Kaberuka was chosen for the award in recognition of his innovative idea which led to the establishment of the Africa50 Fund to speed up the financing of infrastructure in Africa. The award accompanied by a cheque of $50,000 was presented to Kaberuka in Abuja, the Nigerian capital, on Wednesday, January 15 in a ceremony graced by dignitaries from the public and private sectors as well as international donor agencies and diplomatic corps. Kaberuka delivered a thought-provoking acceptance speech in which he regarded the award as a call to action and a commendation of the work of the African Development Bank in support of African countries in their quest for economic prosperity. He paid tribute to Africa's unsung heroes, the millions of African men and women toiling on our farms, factories, offices, informal sector, working so hard and overcoming many obstacles. In his words, "these are not only the true Africans of the Year but Africans of all time." On ensuring a positive trajectory to economic growth, the Bank President mentioned three key priorities for 2014: peace and stability, tackling the question of inclusion and inequality, and jobs. A step change with Africa taking ownership, mobilizing its own energies and resources, putting those savings to build Africa's infrastructure and in the process getting a good return. That is the genesis of the Africa50 Fund. It is about African nations putting in place a fast moving, flexible, commercially viable vehicle for delivery of Africa's infrastructure. It is an African solution to a major African problem." Kaberuka is the sixth winner of the prestigious Daily Trust Award, with prominent Nigerian business mogul Aliko Dangote as First Runner Up in 2013. The Award was instituted in 2008 to recognize and reward exemplary Africans for their extraordinary contributions to human development in any part of the continent. Previous recipients were Denis Mukwege of the Democratic Republic of Congo (2008), late pan-Africanist Tajudeen Abdul-Raheem of Nigeria (2009), Danny Jordaan of South Africa (2010), Niger Republic Jurist Fatimata Bazeye (2011), and former South African President Thabo Mbeki (2012). As the African Development Bank prepares to mark 50 years in service, Donald Kaberuka joins this league of visionary game-changers bringing to the table not only his expertise as an economist but his infectious enthusiasm that Africa is indeed rising and, with the potent fusion of innovation and infrastructure, the tipping point is on the horizon. Copyright © 2014 African Development Bank. All rights reserved. Distributed by AllAfrica Global Media (allAfrica.com). To contact the copyright holder directly for corrections — or for permission to republish or make other authorized use of this material, click here.